There are few bigger names in Burgundy than Louis Latour. This family company – today headed up by Louis-Fabrice Latour, the eleventh generation in charge – can trace its wine history back to the family’s first vineyards acquisition in 1731. Today it operates on many levels, farming its own vineyards in the Côte d’Or (including 27 hectares of Grands Crus) as well as being a significant négociant, but also with extensive concerns in Chablis, Beaujolais and further south, in the Ardeche area. About half way between Chablis and Beaune, the little-known region of Auxois is currently causing a lot of excitement in the Latour/Simonnet-Febvre camp. It is a tiny wine area of 40 hectares, of which Latour owns 15 with plans for substantial growth. 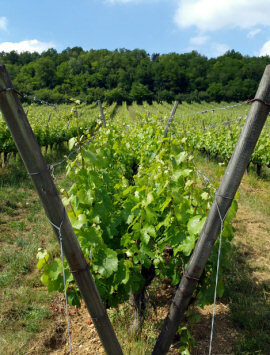 We took a drive down to see the vineyards, on quiet slopes of limestone and clay. The vines here are distinctive, trained on the ‘lyre’ system, with the cordons and canopy divided into two in a U-shape, according to local convention. Jean Philippe explained that this was a major wine region in the 1850s, in fact one of Burgundy’s biggest with 4,500 hectares planted. But with the coming of phyloxerra most people decided to move on to other crops, and the vineyard area shrank to almost disappear. However, in the 1970s the local mayor was keen to revive the industry, so with government help they planted five varieties in experimental vineyards. Those varieties were Chardonnay and Pinot Noir, Auxerrois, Pinot Gris and Aligote. Today Latour is already bottling the first four of those varieties under the ‘Esprit de Lyre’ label (tasted below), but they see huge potential here and have already bought more south and southwest facing slopes which are about to be planted. For now the wines are classified as Coteaux de L’Auxois IGP. Back in the Simonnet-Febvre cellars in the centre of the town of Chablis, and Jean-Philippe explains that all of the fruit for their Premières and Grands Cru wines is hand-picked, and that in the winery everything is done by gravity and conveyer belt – there are no pumps to potentially bruise the fruit. The Grand Crus Le Clos and Blanchots are vinified with some barrel fermentation, though Jean-Pierre has stopped the routine barrel vinification of the Premières Crus: “I didn’t always like it, so I stopped it for all except a few cases where I think it really suits the wine.” As a rule, he says “Chablis and new oak is not good,” so the barrels he uses are at least two years old. All wines do go through full malolactic fermentation. All seven Grands Crus of Chablis lie on the same south-west facing slope. But even within their Le Clos vineyard, a classic Kimmeridgian limestone soil, rich in fossils and sea shells, Jean Pierre explains there are really three terroirs, with more clay at bottom giving rounder wines, the top much rockier and more mineral, and the mid-slope balancing the two. Simonnet Febvre has holdings in all three parts, and whilst 30 years ago frost was a real problem this far north in France, the sprinkler systems and burners they have installed are nowadays rarely used. Whether or not it is proof of climate change, Jean Philippe had to click the frost protection icon on his iPad on only one night last winter. 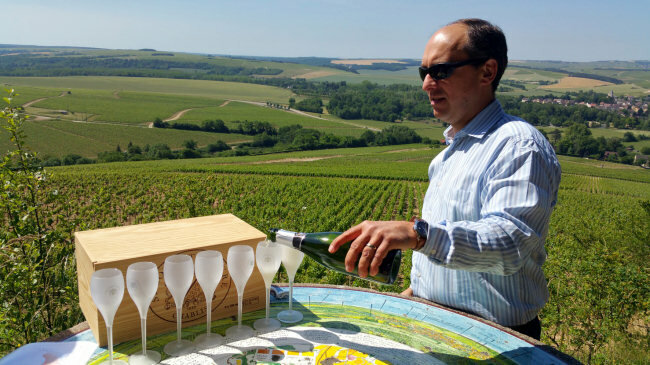 Below: Jean Philippe pours a cooling glass of Crémant on top of the Grand Cru Le Clos. We tasted a number of 2014 wines, newly bottled and some not released at time of tasting. Of these the Chablis 1er Cru Montmains had powerful concentration, with stony minerals and a delicate floral character, but excellent length with orange and mineral acidity (91 points). Chablis 1er Cru Vaillons was almost austere in its flinty, serious style but with just fabulous punch and focus (92 points). See wine-searcher.com for all stockists of Simonnet-Febvre. A very pure and aromatic vintage, very fragrant. Delightful, delicate nose, with the fresh crunch of apple and a hint of oatmeal. Lots of citrus juiciness, quite straightforward, but delicious balance and crispness into the finish. 87/100. Adding a little stone and flint note to the Petit Chablis, a tiny herbaceous character. The palate has more focus and less sweetness/richness than the Petit, with a real lemony focus to the fruit and a dry, savoury finish with lots of grapefruit and lemon zing and freshness, a touch of saltiness. 89/100. According to Jean-Philippe 2013 was a difficult vintage – “cold at the start and humid and hot in the late summer, so we harvested a little early but it was the most difficult growing season for 15 years.” It was also the smallest crop in 50 years. Lovely and quite exotic nose, with a little spice and almost toasty note (though no oak used) and a ripe apple fruitiness. A sense of roundness and richness on the palate, with a broad-based but keen acidity and a nice creamy texture. Delicious and concentrated, but also quite open and charming. 91/100. Taut, mineral-flecked stuff with much more flint and river stone character, the palate orange and lemon, very clear, very precise, with a real mountain stream clarity and flowing, long finish. 92/100. Again there is a flintiness to this, a touch of ripe, almost cabbagey, vegetal note, with a ripe fruit beneath. The palate has lots of fruit sweetness and charm. The richness and ripeness is noteable, with an almost oily viscosity and weight. Delicious and so different again. 91/100. Gorgeous development with honey and opulent richness, a smooth vanillin character and still that core of fat lemon and ripe creamy apple. Plenty of freshness and verve, and delicious nervosity amongst the creamy opulence. 93/100. Very youthful emerald green colour, a touch of fresh leafy herbs, a touch of anise and some saltiness giving a dry, interesting nose. The palate has a rounded, smooth limpidity, with not so many layers as some of the other Crus, but a concentrated and wholesome richness. Great length and huge lime-streaked juiciness. 92/100. Full bunch pressing, then 50/50 between tank and second year barrels. Aged for two years. Delicious hint of vanilla, of almond and oatmeal, but a fine purity of custard apples and citrus. Plenty of concentrated, pure spice-touched fruit, apples and pastry, but a lovely salty definition, the length and precision matched by natural density. Long and persistent finish. Yield for the Grands Crus is around 45hl/ha, as opposed to 55hl/ha for 1er Cru and 60hl/ha for Chablis. JP says a perfect time to drink Le Clos is 5 to 10 years from vintage. 93/100. Blanchot has less clay and more Kimmeridgean than Le Clos, and a little more east facing too. Same winemaking with 50/50 tank and barrel. There’s a deal of creamy oak noticeable on this, gently toasty and mealy, but the aromas beneath are fine – extraordinary note of mint and basil and subtle with white fruits. The palate is dry and chalky, with racy acidity and that keen, intelligent, beautifully composed balance of fruit, acid and the chalk and minerals of Blanchot. Gorgeous harmony again, and beautifully done. 95/100. Rich, the last vintage to be 100% oaked, it has an oatmeal richness and some hints of peach and honey to the tight apple core of fruit. Small nutty and wheatgerm notes. The palate is richly oaked but not overdone, again a weight and persistence of that pithy lemon fruit core. Lovely. 92/100. A sparkling rosé of Pinot Gris, the gentle peachy pink colour coming from just a couple of hours in the press. Based on 2013 vintage. Dosage is 6g/l. Toffee and gentle red berry fruits, a nice gentle earthiness. The palate is fresh and savoury, not particularly fruity, but has a firm briary and apple core and good citrus acidity, a gentle hint of sweetness adding balance. Drinks really well in an understated style, 87/100. Quite a nice deep colour, with a little vanilla and cream, and plenty of stone fruits and a fresh-laundered linen. The palate has some richness of texture and creaminess, good acidity kicks in, lots of dry but ripe apple acid that is mouth-watering, a touch of something saline, and lovely length and style. 89/100. 60% Auxerrois, 40% Chardonnay. The Chardonnay comes from the oldest, east facing block which gives higher acidity. Very much dominated by the Auxerrois on the nose, the profile very similar to the straight Auxerrois. On the palate a little creamier and smoother still, a slight feeling of hollowness for me compared to the straight Auxerrois however. 87/100. Very refined, gentle nose, not so much of the cream or the perfume of the Auxerrois wines, but a sophisticated feel, The palate is satin smooth and has a nice balance of apple and fresh, ripe lemony fruit, just a gentle crushed oatmeal touch of texture and weight into the long, fresh finish. Long and tangy. 88/100. The 100 series blends northern and southern varieties, but all are varietal wines. Lovely dry reducurrant fruit with a little earthy note and a lightly leafy quality. The palate is natural and dry, with a dry redcurrant and cranberry fruitiness. Fruit from the Languedoc and Provence. Nice dry finish. 86/100. One third from Burgundy, two thirds from Luberon and Ventoux. Nutty and creamy, a touch of exotic ripeness. Fine, sweet palate, plenty of sun-kissed ripeness and sweetness, but a nice bit of tight northern freshness and acid structure. Very drinkable and versatile. 87/100. Simonnet-Febvre, 100 Series Pinot Noir 2013, Vin de France, France One third Burgundy, two thirds from the Southwest close to Limoux and from Ventoux/Luberon grown at some altitude. Quite a refined raspberry nose, quite vinous with a touch of briar and sappy quality. The palate is cool and sophisticated, the juicy berry sweetness and a rounding lick of vanilla, with very smooth tannins and good, fresh, lightening acidity. 87/100. Chitry is only 2k from St Bris. Quite a reductive nose, blows off to reveal gooseberry and nettle and very Sauvignon. The palate has lots of lemony freshness, with a bit of texture and almond paste richness from full malo and six months on lees, finishing quite concentrated and powerful. 87/100. Bright, appley and fresh, with some delicate floral character and rich confit lemon hints. 60% Pinot, two years on the lees. Lovely sweet fruit driving this, plenty of ripe apple and hints of tropical, with a sweetness and roundness in the finish – very fresh but easy to drink. 87/100. A saignée of Pinot Noir. Seems a little yeastier than the brut in some ways, very delicate colour and very delicate berry aromas, little rose-hip floral nuanecs too, and nicely dry, redcurrant and raspberry palate with a lovely shimmering length. 88/100. Vintage produced around three times per decade. Three years ageing, and this 2011 just coming onto the market following the 2008. 100% Pinot Noir in this year. Lovely steady bubbles and effervescence. A nice bit of rotty orange and bruised fruit character, the floral and herby character of the Pinot quite pronounced. The 6g/l dosage means it is dry and savoury, with a really keen lemon and lime fruit and pithy, crisp finish, there is a mineral character too giving a little salt. 90/100. See wine-searcher.com for all stockists of Simonnet-Febvre.